← Christmas is over for yet another year – but who’s Christmas was it though? Labour’s candidate is ‘Remainer’ Gillian Troughton, who is both an avid supporter of open borders, and a fan of Corbyn to boot. Labour will be lucky to get even second place, don’t you think? Well, we have the situation here where Labour’s Jamie Reed MP is jacking-it-in at the end of the month, as far as politics is concerned anyway, and is off to do a ‘proper’ job instead, isn’t he? Yep, he knows that the writing is on the wall for the British Labour Party and he is jumping ship, which is already badly holed, before it finally sinks, taking him and many other fellow MPs down with it, eh? Reed is the current MP for Cumbria’s Copeland (where he won the last three General Elections), and that is a heartland seat that has been in Labour’s hands for over 80 years [previously known as Whitehaven] – but not for much longer, perhaps? You see, not only has Labour been losing voters’ support recently in the Country, but it has been doing so in that constituency anyway (by some eight percent under Reed alone). Now, Labour might well just hang-in there at the planned by-election (date as yet not announced), but that will depend on reliance on a further swing to UKIP, or a resurgence of the LibDems [as happened in the recent London by-election on a platform of anti-BREXIT (unlikely? ), if they are to avoid the Conservatives seizing the seat, won’t it? However, Labour have three major problems in their task and perhaps the first of those is its current leader Jeremy Corbyn, re-elected last summer following a vote of no confidence by his MPs. Not only is he an extremely unpopular, uncharismatic leader who inspires few, but he is soundly and stridently vocally ‘anti-nuclear’. Now, you might wonder why that should be such an issue in Copeland, eh? Well, it is because that constituency is the home of the Sellafield nuclear facility, with its now obsolete power plants (being neutralized), and its nuclear decommissioning plant, isn’t it? Yes, but nuclear is significant there because the nuclear industry still provides employment to some quarter of the local voters and therefore provides also a significant foundation base to the locally economy, eh? Corbyn represents a threat to their futures in the area, which has suffered from unemployment, so he won’t be attractive to many, will he? Furthermore, Reed has been one of the most vocal critics of Corbyn’s leadership of the Labour Party, quickly called for his resignation, and even laid the accusation that he had injected the Party with unprecedented poison! 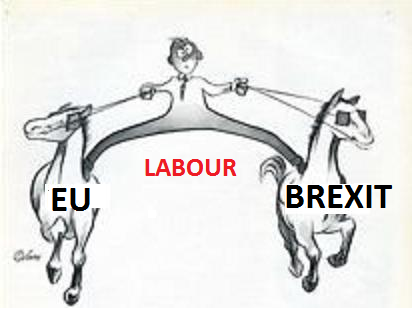 The second problem, and just as critical, is that Labour is one of the wild gang of BREXIT deniers, who want to scupper ‘as far as they can’, the Country’s Referendum vote to leave the EU. However, while that might not matter in many constituencies, it certainly does in Copeland, as it was one of the areas that REALLY strongly voted for BREXIT [62%], and they will not want that win to be denied them, will they?No, and that would require ditching Labour’s planned new candidate, won’t it? The third problem really is that Labour has shown that they are completely ‘out of touch’ with their voters so can’t be trusted – their MP in Copeland indeed supported the Labour Opposition’s stance of remaining in the EU, and it is going to be extremely difficult for their new chap/chapess to overcome the credibility gap with the local electorate, even if they were themselves a Leaver, don’t you think? Labour will announce their candidate for the by-election tomorrow, and they will throw everything including the kitchen sink, into getting a fightback result there (with a Shadow Cabinet Minister indeed heading the team, eh? ), as it is pretty crucial to Corbyn’s reputation – though not his future, as he and his strong-arm muscle men with their Momentum organisation backing, don’t care enough about the Labour Party’s future existence to actually give up power, do they? A further lambasting of Labour in Copeland, like last December’s by-elections in Richmond Park London [lost deposit] and Sleaford Lincolnshire [fourth behind both floundering UKIP and the shambolic LibDems], would set the scene for a substantial wipeout of the Party in this coming May’s local elections, wouldn’t you say? [Even then Corby will cling to his role with even more unbelievable excuses]. In the National polls Labour are direly simply miles behind the Tories (moving towards ten percentage points), but such things are often not reflected at the local level, thought it might be there in Copeland – when they only need an achievable 3½% swing, don’t they? Remember though that the government of the day just DON’T ever win a seat from the Opposition in a by-election – that is the basic statistics, isn’t it? So, if the Tory’s pull it off in Copeland, and they just might, we will have been around to witness a ‘nearly’ unique event of modern times, wont we? This entry was posted in AUSTERITY, benefits, community, economy, education, Elections, farming, fish, government, industry, manufacturing, political parties, Politics, ships, updated and tagged David Cameron, de-industrialisation, industrialisation, Jeremy Corbin, Jeremy Corbyn, Labour Party, libdems, THE RED FLAG, tony blair, UK General Election, Unions. Bookmark the permalink.